The RCBS Precision Mic claims to be a simple and precise tool for measuring bullet seating depth and chamber headspace. They cost approximately $35 each and are specifically made for individual cartridges. I don’t particularly care for its ability to measure bullet seating depth and I think it has shortcomings in that area which limit its usefulness to serious precision reloaders. However, when just used for measuring chamber headspace, the RCBS Precision Mic does an excellent job. 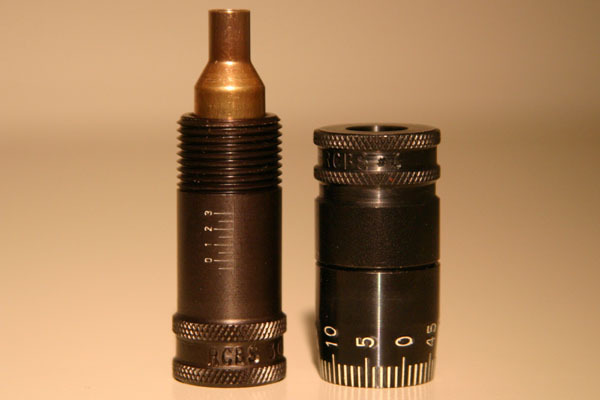 To measure chamber headspace, a piece of fire-formed brass is inserted into the base of the RCBS Precision Mic and the top is then screwed down until it makes contact with the datum point on the case shoulder. Then, a micrometer scale is used to read the headspace of the fire-formed brass vs. the prescribed SAAMI minimum. This measurement is extremely useful to know when setting up full-length resizing dies to give minimal shoulder bump and extend the life of your brass. The problem is the RCBS Precision Mic is a caliber specific tool and they don’t make one for the BR family of cartridges. However, with a little ingenuity, an adaptor can be made up which enables the 308 Winchester version to be used with the 6BR, 30BR etc. By simply placing a short spacer into the body of the tool and dropping the BR case on top of it, the micrometer scale can be bought into the usable range. If the spacer is made to an exact dimensional length, the scale can be effectively zeroed and the tool used to obtain meaningful headspace measurements for the BR family of cartridges. The first step is to obtain a virgin BR case that has been FL-resized to meet minimum headspace dimensions. I run a new 6BR Lapua case through my Redding body die using a standard shell holder to achieve this. Some FL-sizing dies may actually bring the case under SAAMI minimum spec but since the final objective will be to adjust the die for a custom fit, this isn’t particularly important. If you prefer to get a true headspace reading (vs. the SAAMI minimum), you can substitute a headspace go-gauge for a FL-resized case for this first step. Next, you will need to make up an appropriate sized spacer. At first, I didn’t think I would be able to make up a spacer to an exact dimensional tolerance without the services of a machinist. Then it occurred to me to use my case trimmer to cut down a 9mm case to the right size. 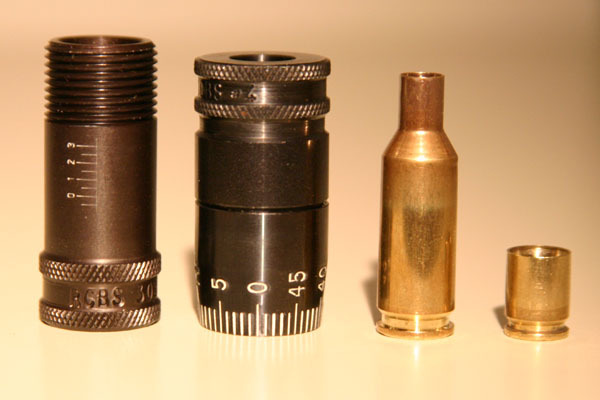 Since the diameter of the spacer was not critical, the 9mm case provided an ideal solution. By using the case trimmer, I could control length to within 0.001" and ensure the end was faced off square with the base. Through a trial and error process, I reduced the 9mm case all the way down to 0.511" and found this to be a perfect fit which gave a zero reading on the micrometer when the FL-case was dropped in on top of it. Now I can use the 308 version of the RCBS Precision Mic to compare brass which has been fully sized in my 6BR body die with brass which has been fired in my chamber. With the spacer inserted, FL-resized cases mic 0.000” at the datum point on the shoulder. Using the same set-up, fire-formed cases measure 0.005”. In other words, my chamber has a headspace of +0.005" above minimum dimensions. This is fairly typical of a custom rifle set up for switch-barrel use. If I were to FL-resize my brass down to minimum spec each time, this excessive working would shorten its lifecycle and might eventually lead to case head separation. Now that I know the headspace of the chamber, I can substitute the standard shell holder on my press with a Redding +0.004” competition shell-holder. This ensures that my cases only receive 0.001” of shoulder set-back. 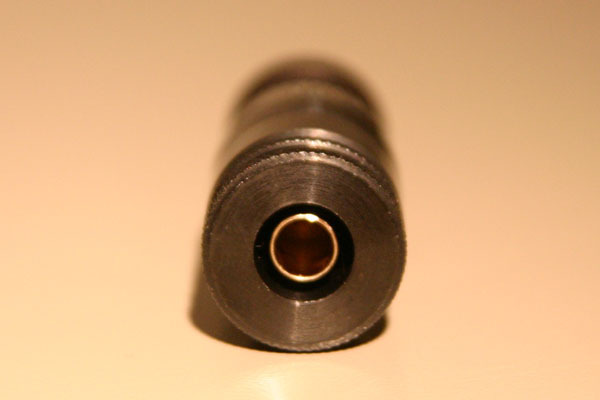 The minimal shoulder bump is sufficient to ensure easy chambering yet practically eliminates the chance of case failure. A quick check with the Precision Mic confirms that resized cases now measure 0.004” at the datum point. RCBS has no plans to make their Precision Mic in 6BR caliber. 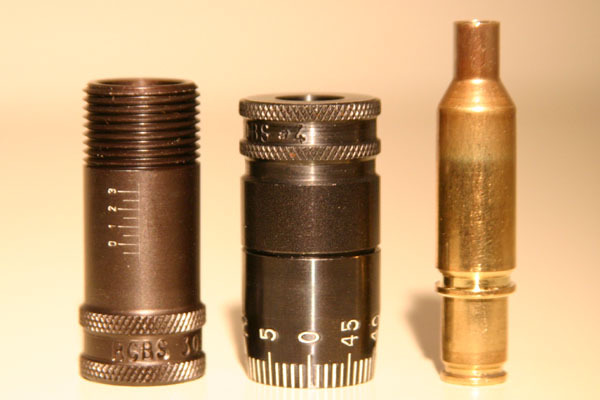 If you already own one in 308 Winchester, making up a spacer will enable you to adapt it to our favorite little round. Admittedly $35 dollars is a bit pricey to buy one just for this purpose, especially considering that a number of the parts supplied are used to measure bullet seating depth and won’t be of any use at all. However, this is something you still might consider if you are looking to make accurate headspace measurements and gain good control over the use of your full length resizing dies. Good luck! Figure 3. Top view of Precision Mic with 6BR case. In this position the MIC indexes at ZERO.